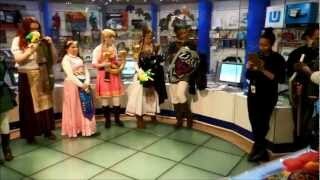 Hyrule Historia release party footage! I really wanted to go to the release party for the Hyrule Historia in New York at Nintendo World, but seeing as I live in California, I ended up not going. I kept browsing the internet looking for footage of it so us sad people who didn’t make could catch a glimpse of the action. I received my copy of the Hyrule Historia yesterday and just tell everyone the regular edition has all the same stuff as the collectors edition, the only difference is the faux (fake) leather cover and the gold trimming on the pages. The only difference is the regular copy has green and a different design on the front. I found this great video on Youtube by kirbygcn17. Click more to see the video. I will also be posting a video displaying some of the Zelda goodies I got on my birthday and links to where you can get them too! Thanks for the video kirbygcn17 and I hope there are more events like this soon (preferably in California, but wherever is fine too).